A fluidized bed dryer consists of air filter , heater , fluidized bed, rotating segment feeder, cyclone separator , bag dust remover, high press . centrifugal fan and stage for operation . According to different characters of different materials to be dried, the dryer can be equipped with both cyclone separator and bag dust remover or with either of them. Generally speaking, for those pellet materials with a large specific gravity, only a cyclone separator is needed. And for those granule or powder materials with a small specific gravity , a bag dust remover is needed and so is a pneumatic conveying device if possible. The dryer can also be equipped with a rotating segment feeder if required. This fluidized bed dryer can achieve automation and continuousdrying process. It has a high drying speed and a low temperature and the product quality can be ensured, meeting GMP requirements. The heating resource can be steam, electricity or furnace. This fluidized bed dryer is suitable for drying pellet or granule materials such as raw materials for medicine,pellets,traditional Chinesemedicine drink granules in pharmaceutical industry;plastic resin,citric acid and other powder or granule materials in chemical industry and drink granules, corn plumule, feed in food industry. The most suitable diameter of the materials is 0.53mm. 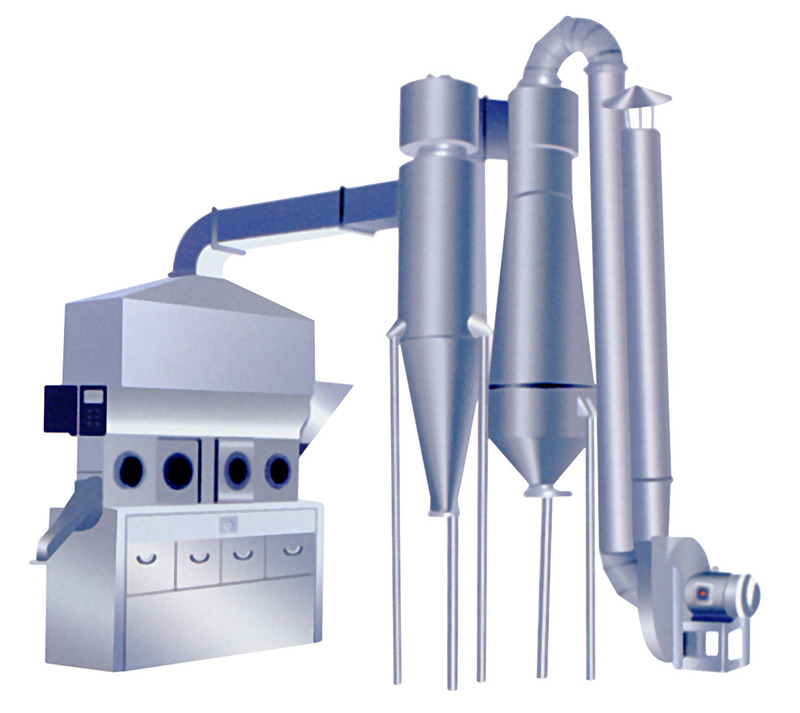 Granule or pellet solid materials are fed into the fluidized bed dryer through the feeder. Filtrated clean air is heated and charged onto the bottom of the fluidized bed to contact with the solid materials on the distributing plate, where fluidization can be reached and the heat exchange between solid and air can be achieved. After being dried, the products are discharged from the outlet. Waste gas is discharged from the top of the fluidized bed, and powder materials are recovered by the cyclone separator or bag dust remover. Fluidized bed , cyclone separator and cloth bag dust extractor should be placed on flat concrete groud without any screws on fou -ndation . The air blower may be installed indoors or outdoors with foundation and screws.The plane design can be pantly adjusted in accordance with the building conditions. No air should leak from the air pipe system so as not to influence the drying efficiency. The Big Fluidizing dryer is used in drying CPE. (10000-20000T/a).